Owing to our profound experience in the industry, we have been able to offer Fume Hood. Fabricated using superior-grade components such as stainless steel, the range is widely used for throwing out harmful & toxic fumes. Along with this, the offered range of walk in fume hoods is available in variegated dimensions, shapes and allied specifications to meet the preferences of clients accordingly. 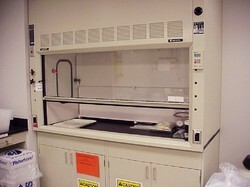 Fume Hood is the first defense to minimize chemical exposure to research workers. They are considered the primary means of protection from inhalation of hazardous vapors. Our FH series have three models in total.